Sharing nuggets of knowledge and ideas accumulated on health, strength and fitness based experiences. While here, feel free to hit the comments section and share your invaluable feedback about the blog's betterment. Have fun. If there's one thing that most gyms in hotels or apartments have got a solid issues having, it's the squat rack/squat stand/power rack/anything where an Olympic bar can be set before squatting it properly. "What if I told you there are no racks in the gym now? Good luck bringing that bar down to earth from there." 1. Not squatting at all: It could be a definitely acceptable method if the trainee under consideration already has issues with squatting and is medically advised to utilise other leg strengthening movement patterns. For the rest of us who have no business making excuses, it is serious training time and opportunity missed not squatting with a heavy bar on our backs. 2. Using DB based variations such as the Goblet Squats: Often in the middle of two training cycles which incorporate heavy squatting, some fruitful variation can be introduced in the form of Dumbbell or kettlebell loaded squats such as the very effective Goblet Squat. The Goblet squat is a very productive exercise in its own right and is a superior hip mobility and squat movement training tool. 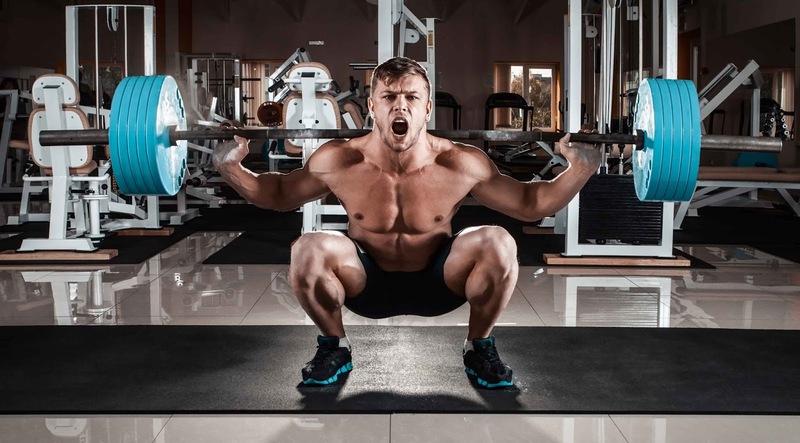 As coach Dan John might suggest, it is one of the most effective movement to train the primal squat pattern for someone really new to squatting. For the others who have had a significant history of squatting, the idea of relying solely upon Goblets might lack the degree of structural influence that regular back squats can produce. 3. Attempting to reclaim their man-card on the leg press machine: The leg press is a great training machine. It allows trainees to reach impressively high levels of muscular loading and create localised hypertrophy, especially for training in the 10 to 2 repetition range. In other words, the leg press is the Back-Squat-challenged sloth's wild card into hoisting insanely huge loads while training legs. But that entirely is its problem as well; the leg press is a non kinetic movement. Considering the fact that rarely do we encounter situations in the real world where we are stuck with a tonne of weight supported on the soles of our feet while we are braced on our backs on the ground, the leg press becomes devoid of a very big portion of the real world, usable strength that we can otherwise own. it thus stays as a great staple, secondary or ancillary move, but can seldom if ever replace it's mother, back squats. Not to mention how the tilting of the pelvis around the coccyx region during the bottom position of the leg press can raise significant questions on spinal safety considering nobody leg presses lesser than a house. To summarise, just like every other big movement, the barbell squat becomes seemingly irreplaceable in its grandiose right. Let's look at the squat closely, It is a basic primal movement and is the chosen manoeuvre when a heavy bag of sand/cement needs to be carried for a distance or supported/hoisted over a platform by construction workers. This might be a possible hypothesis on how the squat really came into existence. When it comes to squatting without the rack, we are more concerned with the part where the bar is put on the shoulders rather than the squat itself. Cleaning and pressing the bar will almost always be ruled out as a method of choice since we can never out-clean or out-press our squat. Especially after finishing a gruelling set of squats, we can not rely upon the strength of our shoulders to press the weight and bring it back in the front. Not until recently did I found a picture of Andy Komorny doing a weird version of squat where the bar wasn't straight across his back but was rather at an angle to the vertical. 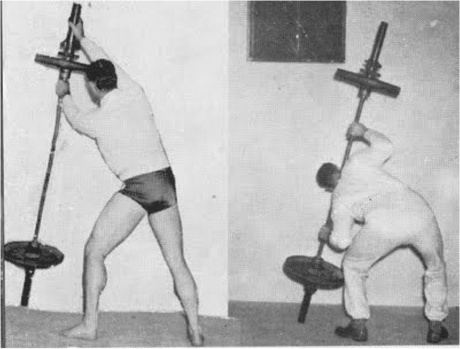 Reading through the pages of Pavel Tsatsouline's Naked Warrior, I discovered that it was in fact a lift where you pick up a loaded barbell right from the ground and then lever it over your back until straightening it fully into the top position of a squat. How incredibly raw! At first sight, I did have my reservations as to how dangerous can this movement be, but something inside me told me that I had had my aha moment. 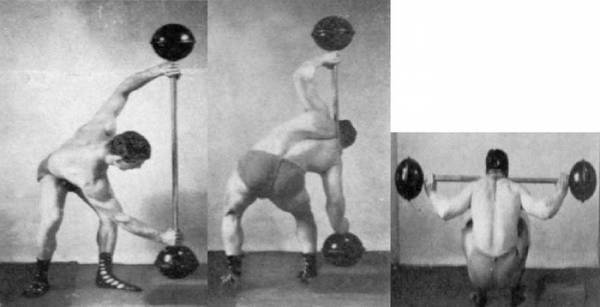 I researched this further and found that it is called the Steinborn Squat Lift, named after the legendary strongman credited with the discovery of the barbell back squat(the world knew only the deep knee bend before him), Henry 'Milo' Steinborn. 1. Place the loaded barbell on the ground. The longer the barbell, the better. My personal experience has been training in a gym with a six feet long barbell being the longest. I am six feet tall and trust me, this becomes a real menace, while mounting the bar during the Steinborn lift. I'm an object of entertainment for those minutes for everyone in the gym. 2. Keep a rubber matting, mattress or some similar cushioning surface that has sufficient give in it under one end of the barbell. This is the end about which the barbell is very soon going to get upended. 3. Pivot the barbell about this end by picking the other end. This should look like a Landmine unit being lifted levered on the other end. 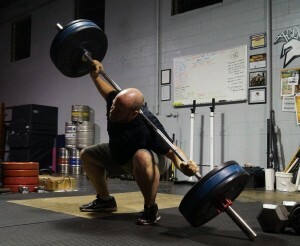 By now the barbell will be standing on one end supported by you with your hands on the other end. 4. Plant one foot about six inches from the bottom end and get under the barbell . Place your neck approximately near the centre of the bar by transversely tilting your spine. Careful; this is the tricky part. As you lock your head near the centre of the bar, also simultaneously squat down to allow the bar to slowly descend from a vertical to a horizontal position. 5. By now, the bar is slanted across your back and you are in a near bottom squatting position. The next step is to slight pull on the upper end of the bar with your grip and push on the bottom end with your other arm, all this while allowing the back to absorb any sudden jerks resulting from the grounded end of the bar coming up form the ground. 6. Well done. the bar is now atop your back, and you are in the bottom position of the squat. Bottom. That is where you start squatting the Steinborn way. 7. While dismounting the bar, reverse the sequence of steps given above. And here's the entire lift in action. This is a crazy Steinborn Lift done by Scott Campbell. That's 425 pounds! So, you see, the part where you get the bar on your back from the ground is actually the most technically challenging part and not the squat itself. As such it demands utmost focus and practice before you can start lifting really big numbers in this lift. Which is in fact a blessing in surprise(as you will see shortly below). The list of positive benefits from the practice of Steinborn lift are manifold. 1. Since this is a very intimidating lift, most folks will have no business lifting their usual squat poundage in the Steinborn. This means that there is an automatic upheaval of technique and the lift becomes safer, especially for trainees who regularly overestimate their squat strength and end up with a sloppy and pain/injury inducing squat. As such several coaches even suggest using the Steinbron squat as against the squat from the racks for teaching the squats. 2. Following from the previous point, The compromised position of the bar in the beginning requires that you stay entirely tight right from the beginning, lest you risk bar slippage or tilting. A tight or stiff squat is almost always safer and more effective. These merits once again place it in a staple list of moves for learning the squat. 3. Once you have reached a respectable expertise level in the Steinborn lift, you are now equipped with the ability to squat in almost any gym that has an Olympic Barbell; no racks and stands needed. Of course you will very rarely be able to squat super heavy using this method. but that single trade-off is covered by the huge boost in the squatting technique that you experience. The record set in the Steinborn lift is 553 pounds made by Henry Steinborn himself. It is a frequently contested lift in the All Around Weightlifting World Championships. This lift does have many more subtle details, though I believe that the mere act of getting started with it might be the first step towards learning much more about this unexplored movement. As I keep practising it, many more ways of making it better and safer keep dawning upon me. A lost lift which has the potential to solve your grave gym issues that can take you out of the squat-less training ruckus and enable you to reap the benefits of the capability to barbell squat in virtually any gym in the world. Use it and never leave gaps in training programs again, even when you travel to the most impossible destinations. Do expect the startled onlookers give you gazes of astonishment.